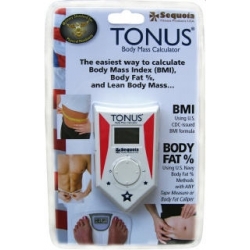 The Tonus Body Mass Calculator is the perfect tool to use at home or the gym to calculate BMI, Body Fat %, and Lean Body Mass. For body fat measurements, all you need is a tape measure or body fat weight, it automatically calculates BMI and Lean Body Mass. One button with 4 positions controls all functions and entries. All you need to know is your height and weight. Keep the calculator in your gym bag or bathroom and the next time you weight yourself, get your BMI in a snap!